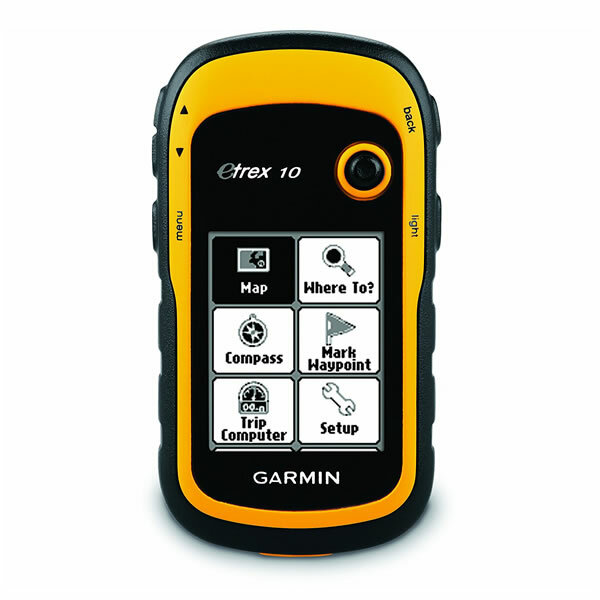 Garmin eTrex 10 is the entry-level handheld GPS device from Garmin. It is perfect for walking, hiking and geocaching. It features a 2.2-inch monochrome display and is both waterproof and rugged. 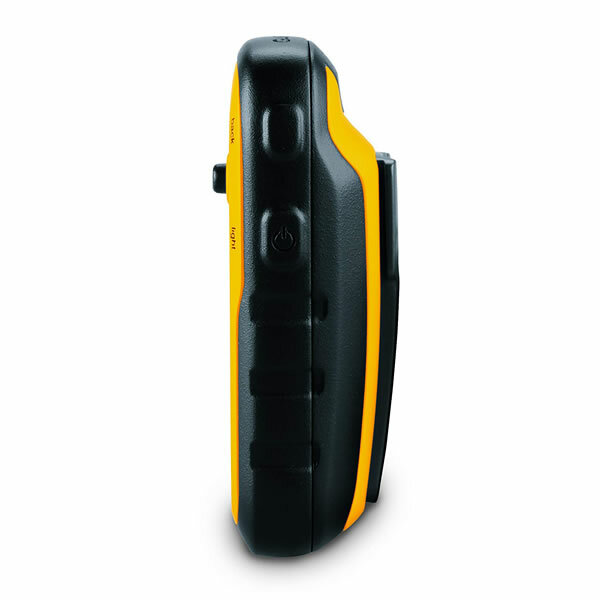 The eTrex 10 has a 25 hour battery life and is designed for paperless geocaching eliminating the need for carrying paper with the geocache details. Garmin eTrex 10 is the ideal partner for hiking, orienteering and of course geocaching - a special eTrex 10 geocaching starter bundle pack is available. The eTrex 10 is also very compact, at just over 10cm in height, 5cm wide and 3cm deep it's small enough to fit into your pocket ready to assist you in your outdor pursuits. Coupled with this the eTrex 10 also provides up to 25 hours battery life. At the centre of the eTrex 10 is a 2.2-inch (5.6cm) monochrome display. Plus finding your way around the eTrex 10 menus is easy using the unit's thumb stick. The eTrex 10 is built to withstand the outdoor environment. 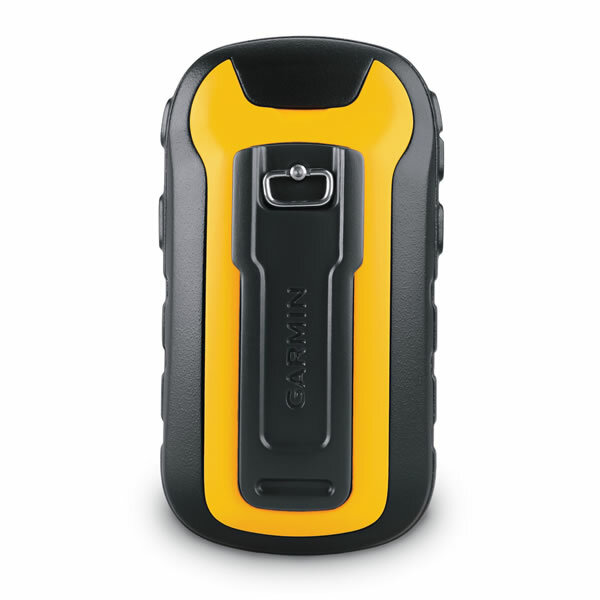 Its rugged construction makes it very durable and it is also waterproof to IPX 7 standards. 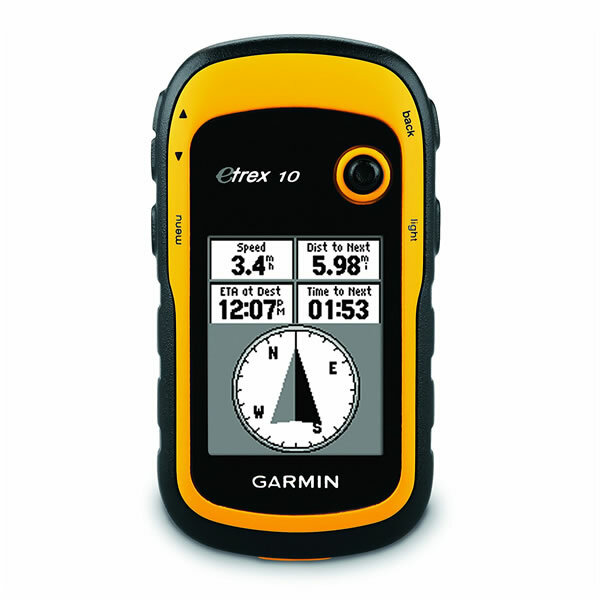 The Garmin eTrex 10 is also the perfect GPS device for geocaching. 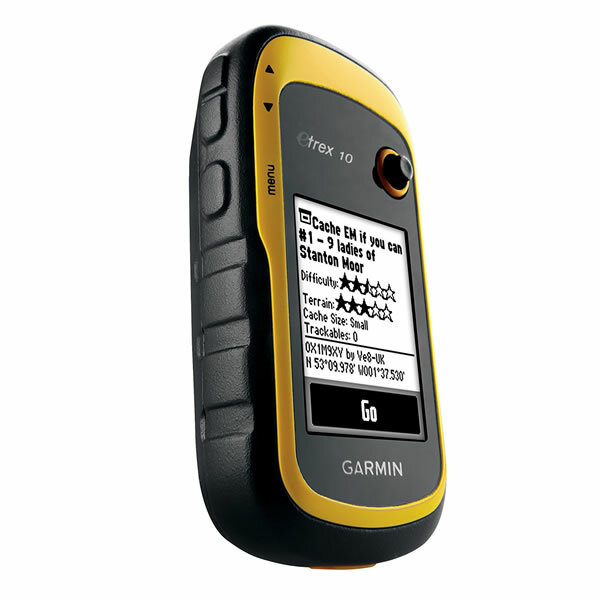 This Garmin GPS device is designed for paperless geocaching by supporting GPX files. It will save to your device co-ordinates of the geocache as well as the location, terrain, difficulty, hints and description. 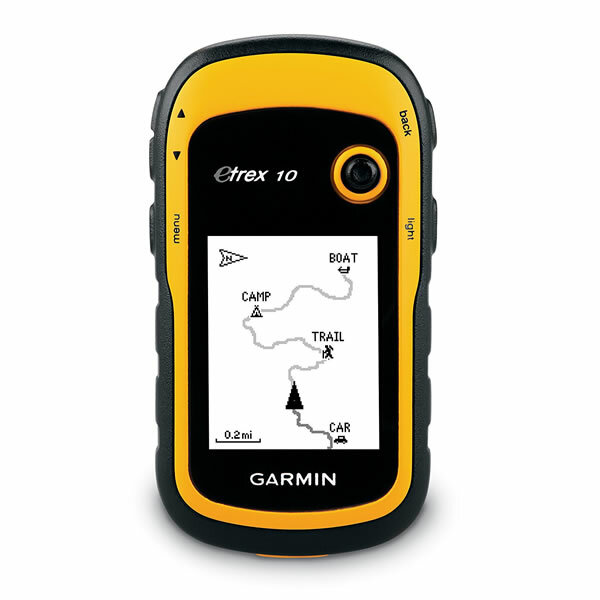 This saves you printing out the geocache details and carrying them around with you - just download to the Garmin eTrex 10 and go. The eTrex 10 was also available as a geocaching bundle. The eTrex 10 geocaching bundle provides everything you need to create you own hidden "treasure" adventure. Included in the geocache kit is: a geocoin, lapel pin, lanyard, logbook, pencil, stickers and OpenCaching guide and container. The geocaching kit is also sold separately from ActiveGPS. This Garmin handheld it equipped with EGNOS-enabled GPS receiver and HotFix satellite prediction. This means your Garmin eTrex 10 will lock onto satellites quickly and accurately and will keep its GPS signal even in wooded areas and mountainous terrain. In addition the eTrex series also uses GLONASS satellites as well as GPS satellites. This results in 10% quicker lock on to satellites. In fact there are 24 more satellites to lock on to compared with using GPS on its own. Do you have a question about the Garmin eTrex 10 or other handheld GPS related question that's not been answered on this webpage? Please see our handheld and Outdoor GPS FAQs page for questions from other customers.Plus if the answer to your question isn't featured, use the online form to ask us for the answer. Alternatively please telephone 01733 777623 Monday to Friday (9:30am-5:00pm) to speak to one of our sales team. 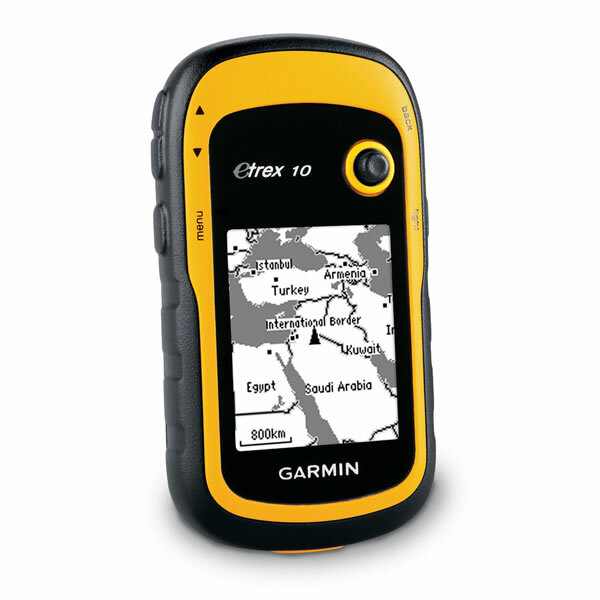 Garmin eTrex 10 is preloaded with a Worldwide basemap with shaded relief. Please note: Additional maps on SD cannot be loaded to the eTrex 10. Unlike the eTrex 20/30, the eTrex 10 does not feature a SD/microSD Card slot, an easy way to add new maps and mapping updates. Looking for accessories and spares for the Garmin eTrex 10? All parts are genuine Garmin product and specifically designed for use with the handheld Garmin eTrex 10 device.